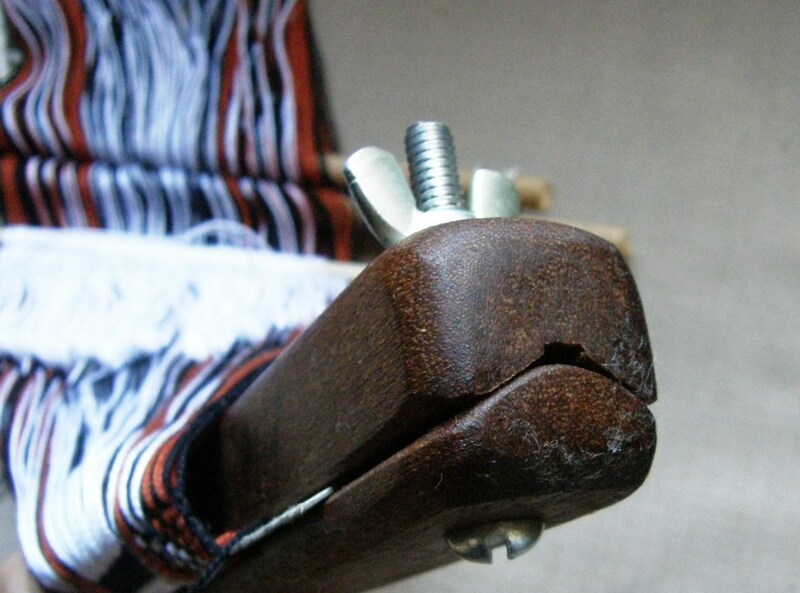 Backstrap Weaving – Tools, Trinkets,Tinkipaya and Treasures from the Lowlands. It’s been one of those computer weeks…chained to the keyboard…. that has left me with little time at the loom. Still, I discovered a new weaving tool, fell in love with yet another weaving style, made a couple of things from tiny samples and rediscovered some bits and pieces of Bolivian lowland handcrafts that I have had stashed here and there around the house. I inherited this from the Santa Cruz Handweavers Guild and it used to belong to Nora Rogers. 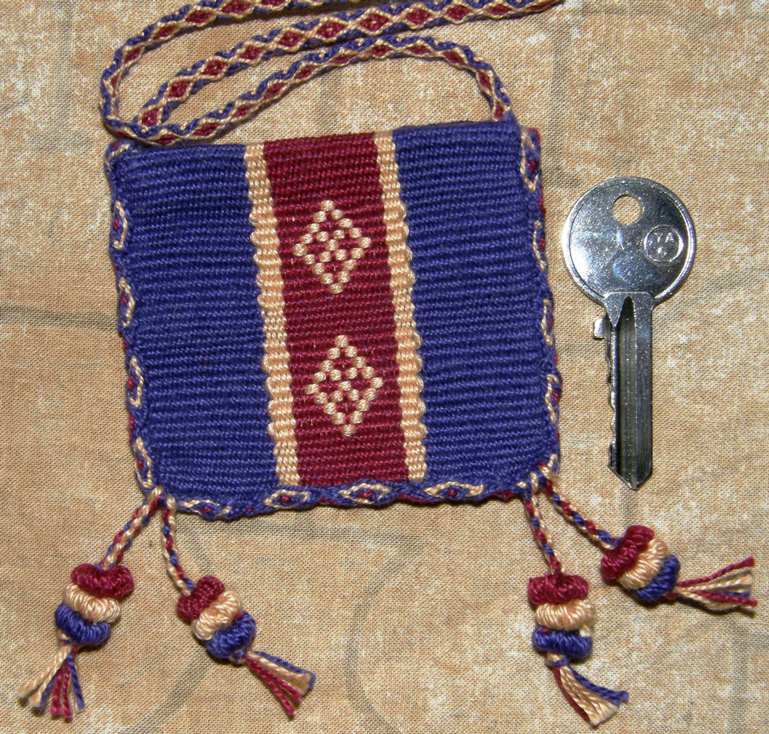 It was holding the end of a Hopi wedding sash in sprang technique that she was creating. I don’t know if it was bought or home made but it is heavy and solid and does one heck of a job clamping. The beauty of this for me is that I can weave a piece and then clamp this thing onto the warp, cut off the finished piece and continue to weave! It isn’t just two flat pieces of wood clamped together. The two pieces are shaped so that one piece fits neatly into the other. It holds really well and there is no need to have knots on the end of the warp to stop it from slipping through. I love it! So, I was able to cut the little Bedouin sample on which I was working last week and carry on weaving on the same warp. I wanted to make the little Bedouin sample into a small amulet-type bag as a gift for someone and didn’t feel like waiting until the whole warp had been woven, nor did I want to cut off and just abandon the warp and waste the yarn. I need more of these clamps in different lengths! So, you may remember that I was experimenting with using double weave for the Bedouin shajarah patterns and that I was trying to handle the two wefts in a way that didn’t make the transition from double to plain weave too abrupt. I finished the first sample, added a piece of cardboard to separate the start of the second one, wove a bit, applied the clamp and then cut off the first finished sample. I was so pleased with it all…the finished piece, the double weave and the nifty new tool… that I had half sewn up the little bag when I realized that I hadn’t yet taken pictures of the inside to show the double weave and the lack of long floats So here is one not-wonderful photo of my trying to hold the thing open while taking a shot… but I think you get the idea. I love these little amulet bags. What are they good for? I don’t know…they are just so cute! I have decided to call them “doorknob danglers”. This one is for a friend but others will be dangled from doorknobs and will be used to stash those odd things that one finds on the floor and doesn’t know quite what to do with…like that strange button that doesn’t seem to belong to anything. I guess they could also be used to hold jewelry especially now that my pieces with Bedouin designs no longer have any floats on the inside and, therefore, nothing on which jewelry can get caught…yay! And they give me an excuse to do the dressing up thing…you know, add braids and tubular bands, cross knit looped edgings etc.. I made a four-strand braid for this one and then sewed it to the edges. I added extra strands to make the tassels. Here’s one I made along time ago and gave away. This was fun to decorate with a ñawi awapa, Bolivian pom poms and a crossed-warp strap. Here is another band experiment that I decided to turn into a ridiculously tiny bag. I think that this one will hold my house key in my purse. I haven’t had time to dress it up yet and I will probably sew a snap closure to the inside and add a wrist strap. I have already had a friend ask me to make her a tiny one like this for her guitar picks. 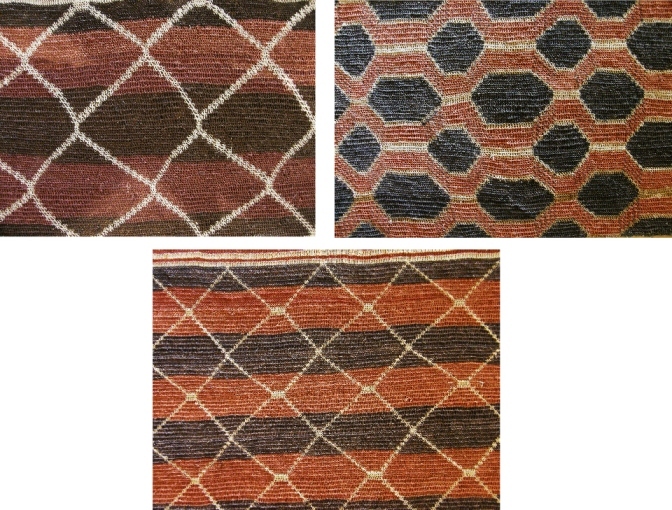 Now, what about this weaving style that I have fallen in love with….it’s Bolivian, it’s from Tinkipaya… and it’s “wow”. I saw a weaver from Tinkipaya at work at the Tinkuy de Tejedores in Urubamba, Peru in 2010, have seen and admired lots of their work for years especially when I was in Potosi learning to weave, have a fabulous book on their designs by Veronica Cereceda and now, after all this time…suddenly it really grabs me. 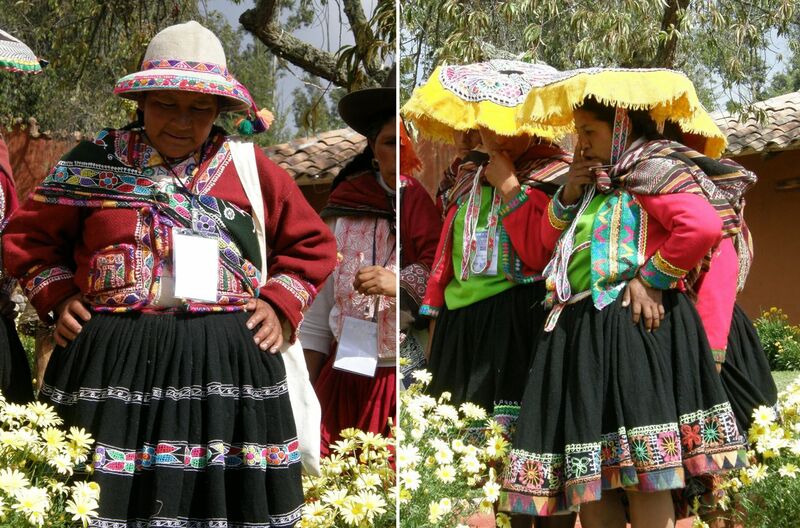 What I think I loved most about seeing the lady from Tinkipaya weaving when I was in Peru was the reaction and intense interest displayed by the Peruvian weavers. I delighted in watching their stance and expressions while observing the Bolivian weaver at work. 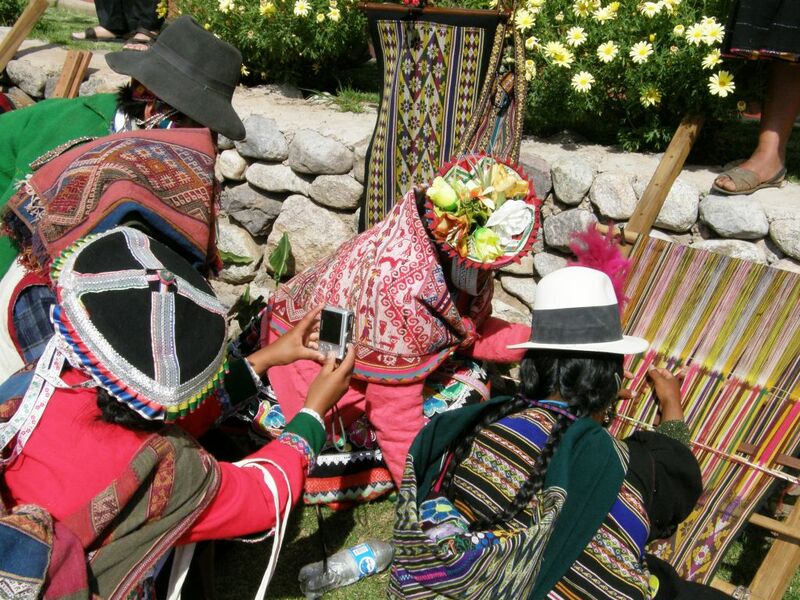 And some of the Peruvian weavers were just as intent on capturing the moment, whipping out their digital cameras. But most times there wasn’t a chance to see as the weaver had a solid wall of admirers around and above her so I had to settle for enjoying watching the watchers and there was much to be enjoyed in that activity. 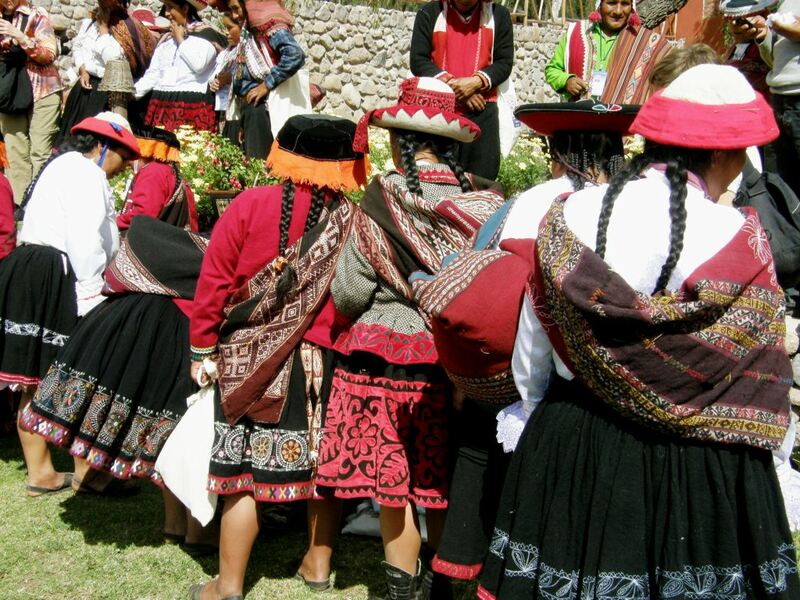 I enjoyed looking at the hats, the skirts, the footwear, the woven cloth as well as listening to the sound of the conversations in Quechua. While the Tinkipaya weaver does her pick-up (amazing how she could even do it with all that attention focused on her! 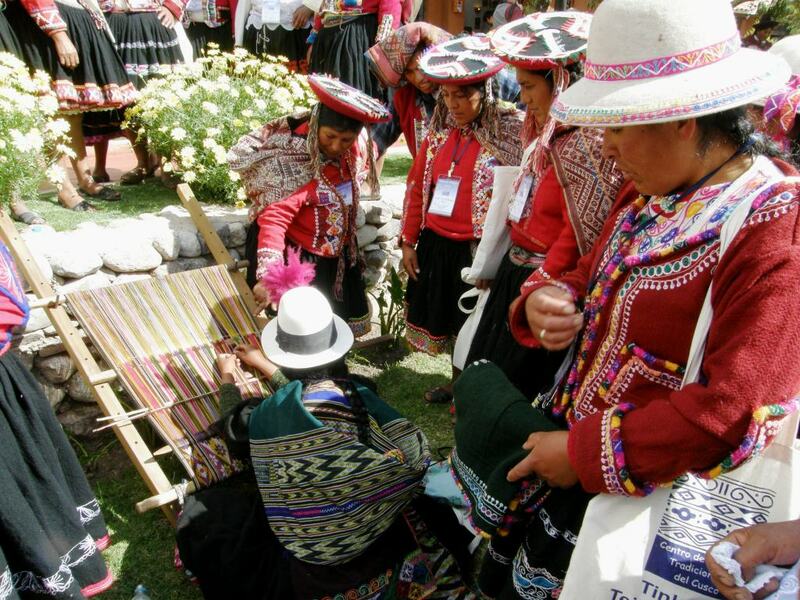 ), one of the Peruvian ladies appears to be pointing out the picking cross that she is using …held on two cords high above the weaving line and beyond the heddle rod. 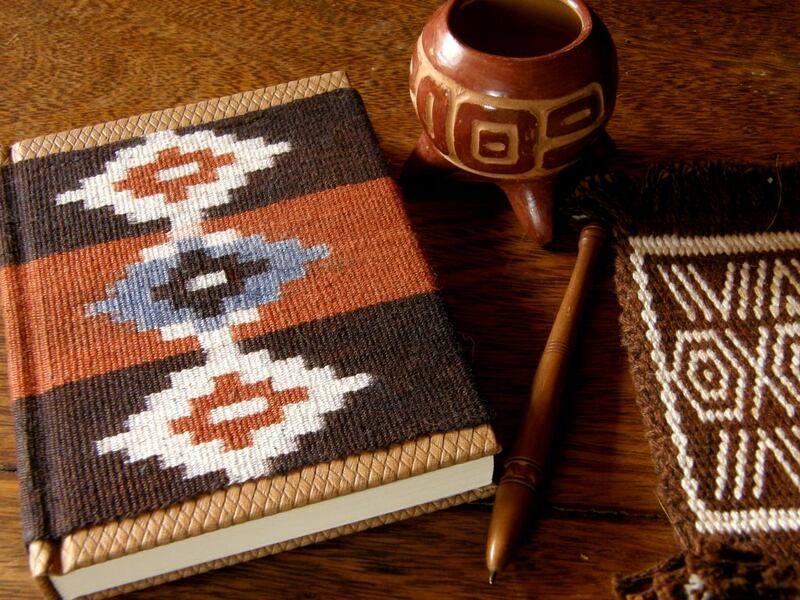 There is a wonderful museum in the Bolivian city of Sucre which is currently devoted to the work of the weavers from Tarabuco and Potolo but which I have heard is going to be expanded to include the weaving of two more Bolivian areas…those of Tinkipaya and Calcha. I need to gather more pictures so I can show you to what I am referring and why I am so enthralled. From Tinkipaya in the Bolivian highlands let’s drop down to the lowlands, where I live, so I can show you a few of the crafts of this area…bits and pieces that I have bought from a co-operative store called Artecampo just one block from my house…things which have gotten stashed away as my little home got filled with more and more books! When looking for something this week, I started discovering these things tucked away in corners and decided it would be nice to take a look at them here. 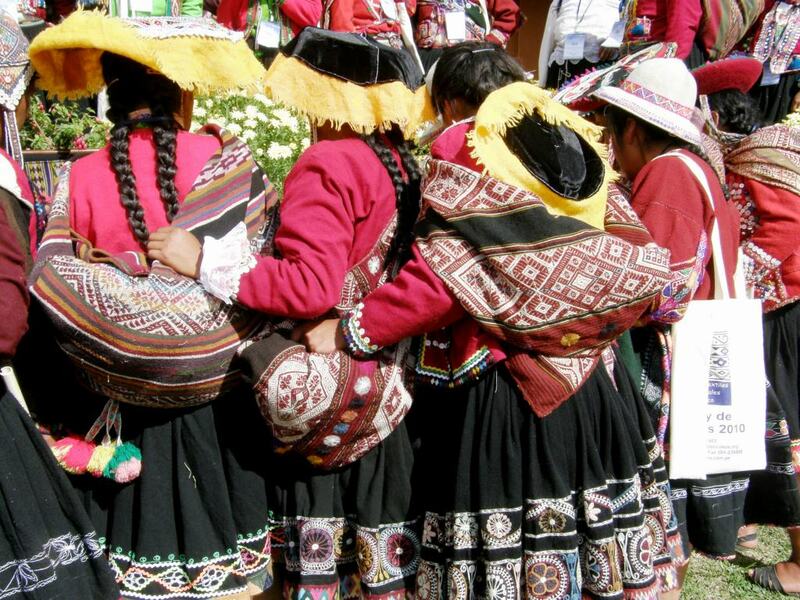 Artecampo sells crafts of the various groups of artisans in the Santa Cruz area which includes the Ayoreos, Chiquitanos, Guarayos, Izoceños and Criollos. 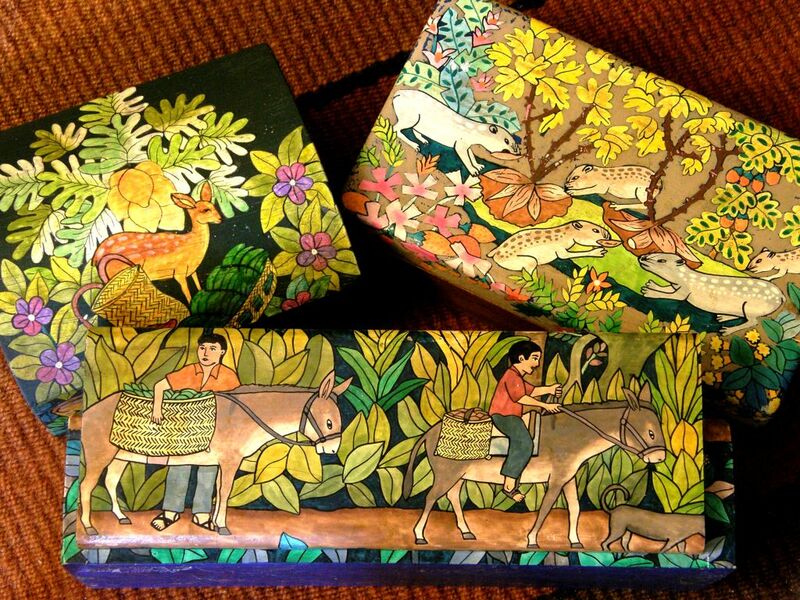 These sweet wooden boxes are painted by a group of boys and girls, the youngest of whom I am told is eleven, from the community of Guarayos de Urubichá. The idea for this craft was born when the Center for Research, Craft Design and Cooperative Marketing (CIDAC) made an experiment over twenty years ago in this community by giving the school children paper and colored pencils and asking them to draw scenes of life in their community. One youngster was selected to be trained in painting techniques in the city of Santa Cruz and then returned to his community to pass on his skills and knowledge to his young peers. The boxes are posed on a woollen rug woven in Vallegrande in the foothills of the highlands. Maybe one day I will go there and get to buy some of this wool for my own weaving as there is certainly none to be found here in the city. 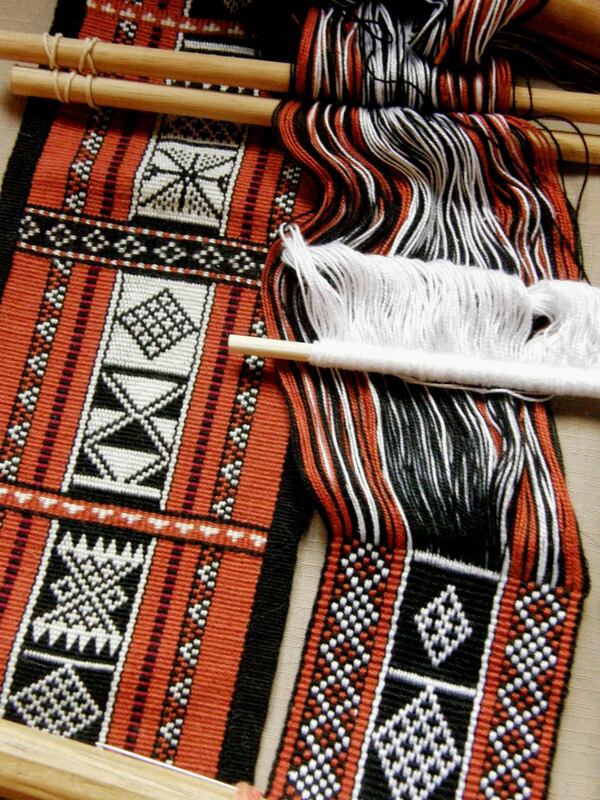 The people of Isoso are a unique mix of Guaraní and Chané cultures and produce woven cotton pieces on leaning vertical looms. Hammocks, table runners, placemats, bags and wall hanging are among the items sold at Artecampo. Clay pieces from Guarayos de Urubichá and Cotoca…. 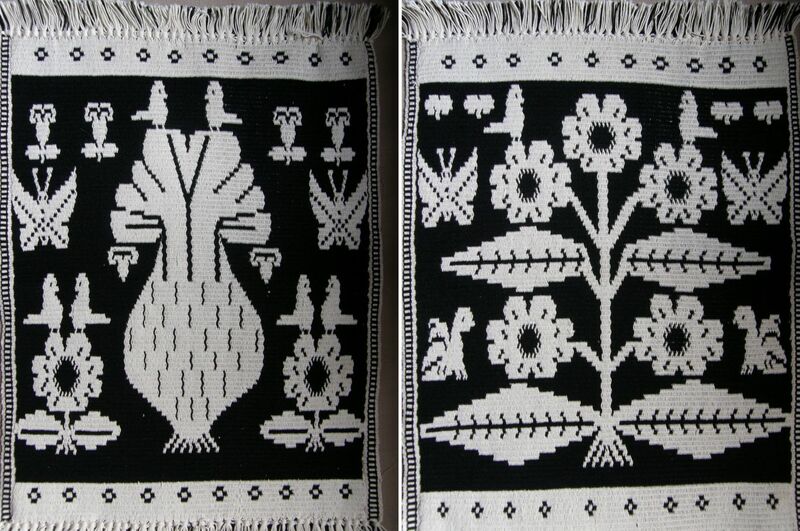 The embroidered scene on the cloth in the background is typical of the color, and depictions of lush vegetation and animal and insect life present in many of the crafts. I love these simple solid coiled baskets and must ask the folks at Artecampo to remind me of their origin. 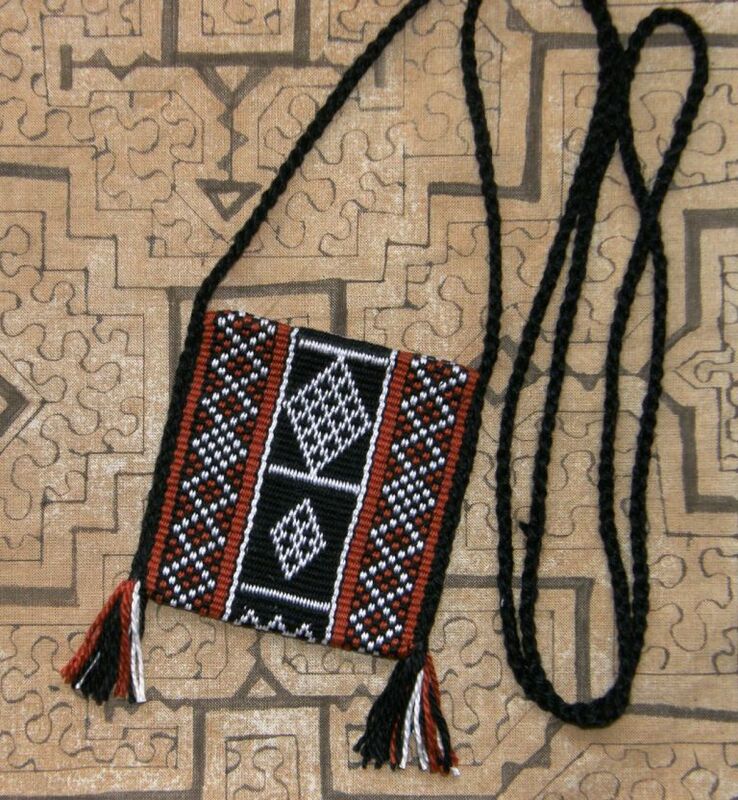 My favorite things of all are the looped bags made by the Ayoreo craftswomen using a fiber called garabatá which is extracted from the leaves of a plant in the pineapple family and twisted by rolling on the thigh. As far as I can tell these are the most “genuine” articles that Artecampo sells. 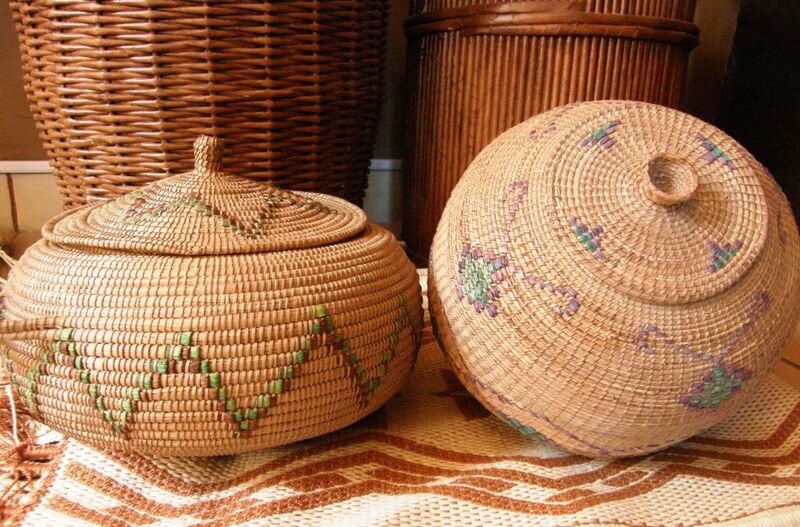 The bags have always been used on a daily basis by the Ayoreo people and have not been altered in any way for the tourist market. I have opened out the bags and use the pieces as wall hangings. I love the colors and the smell and feel of the fiber. They are on the wall of my bedroom and now, would you believe, it has just occurred to me that these colors must have crept into my mind when I planned my most recent ikat experiment pictured above. 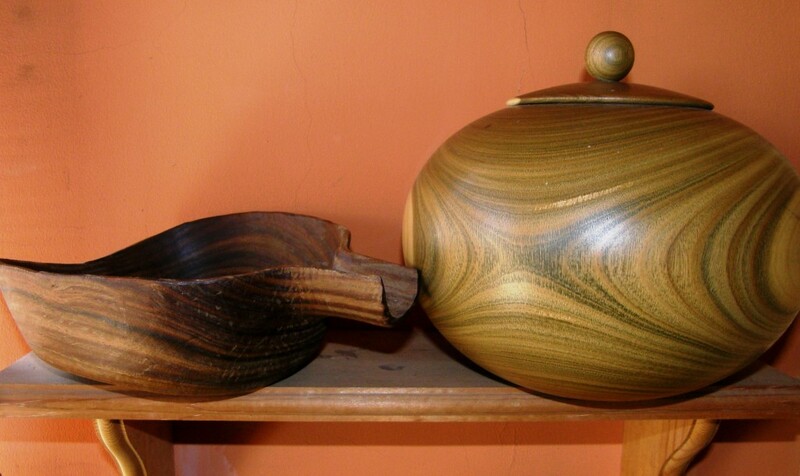 The other “genuine” piece that I treasure, especially since it is no longer being sold, is the wooden bowl/scoop below left, also made by the Ayoreo people. It is lovely to hold this piece in your hands and feel the cool smoothness of the wood. Of course, this is just a fraction of the things that are sold at the co-operative store. The store does not allow pictures to be taken and from now on when I take visitors there I will have to make sure that I take pictures of the purchases as I won’t be buying any more things from there…no room! 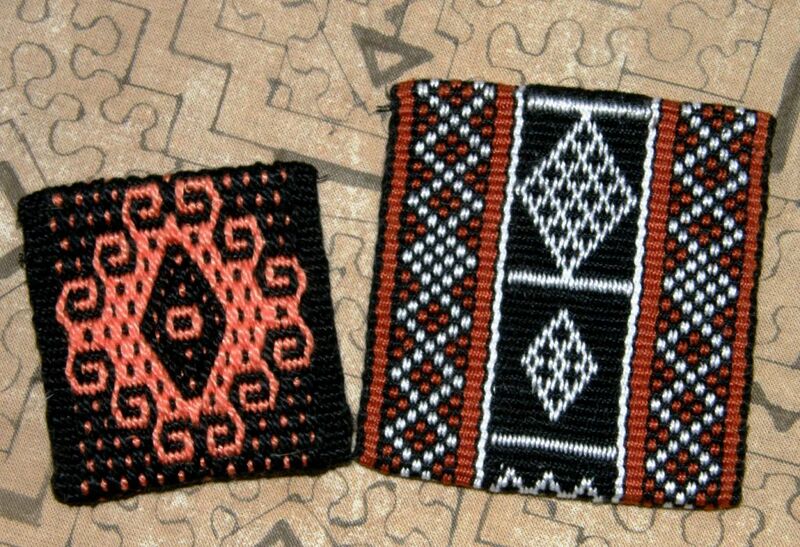 I wish I could show you more of the beautiful textiles they have, both woven and embroidered. I take a lot of pleasure from dropping in there from time to time and seeing what is new. They are quite used to having me come in an stroll around and not buy anything. Well, time to put this blog post to bed and get back to the other keyboard stuff so that I can then do what I really want to be doing…weaving! OMG! I love, love, love the photos! I have extreme bag envy! I want to make one to hold my rosin. The baskets are to die for. You must be in sensory overload all the time. Please more info on your new discovery technique. ps. 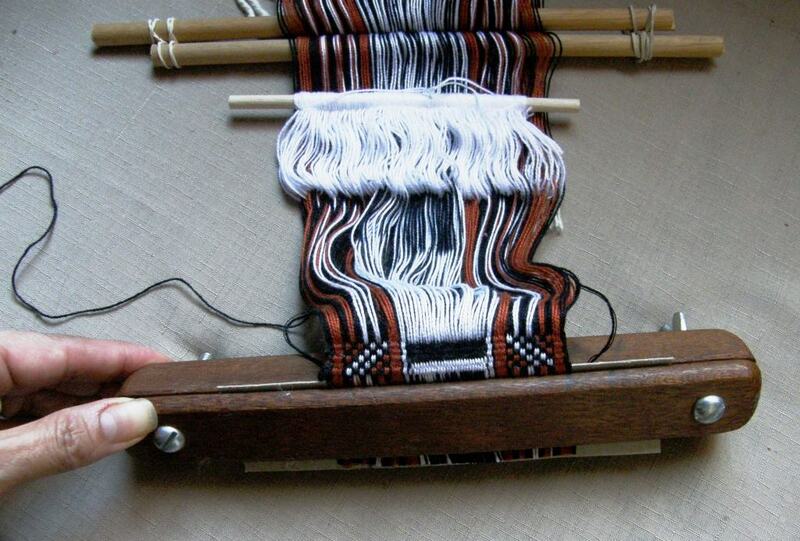 I have a warp all set up for double weave, need to make some time to make heddles and then can start weaving. Hi Marge, I am so happy that you are so taken with the bags and the baskets. thanks to you I now know what rosin is! Hello Gun-Marie, what an interesting background you have. Thank you for your comments. I do expect to keep doing this…it has become my life now!